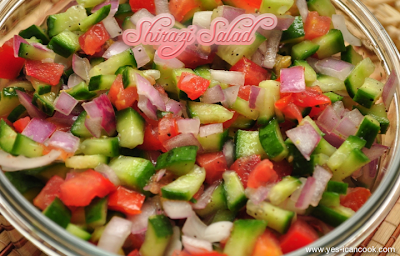 Shirazi Salad is of Persian / Iranian origin and it is a very basic yet flavorful and tasty salad. I tasted Shirazi Salad in an Iranian restaurant and fell in love with it instantly. I would fill half my tummy with this tasty salad. I made this at home for the first time and I am pretty happy and satisfied with the results. I can now have Shirazi Salad anytime I want. I referred to several online recipes to prepare this salad and finally mixed up my own quantities. 1. Wash the cucumber and chop it into very small pieces. I cut each cucumber into 12 slices vertically and then chopped them. 2. Add the cucumber pieces into a mixing bowl. 3. Peal the onion and chop it into small pieces as close as possible to the same size as the cucumber. 4. Add the chopped onion to the cucumber pieces. 5. 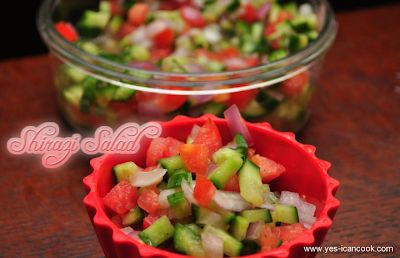 Wash and chop the tomato into small pieces as close as possible to the same size as the cucumber and onion pieces. 6. Add the chopped tomato along with all its juices into the mixing bowl. 7. Combine all three really well. Cover and place in refrigerator for about 30 minutes. 8. Add lemon juice, salt, pepper and mix well. 9. Chop the mint leaves finely and add them to the salad. Mix well. 10. 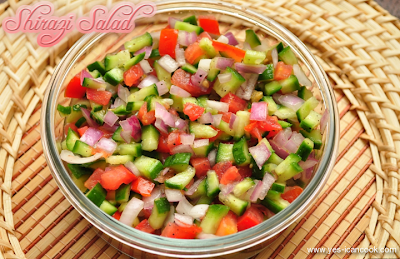 Refrigerate for a minimum of 4 hours for the salad to taste best. 11. Mix thoroughly before and during every serving for the juices to be served with the salad. The salad looks colorful and pretty simple to make. Yes Meena and tasty too. The addition of mint leaves adds a wonderful flavor. Colourful salad, lovely medley of crunchy veggies. Very good salad, it has all the veggies, Love it. Beautiful and mouth-watering salad.. Loved it.. Thanks for sharing with us. Very colorful salad! healthy & refreshing too. Thanks for stopping by my blog & leaving beautiful comment. This looks so colorful with whole lot of different fresh veggies.. Wow bowl of sald and curd rice is all I would ask for! Sure would be an awesome combo. loved this very colorful salad dear! 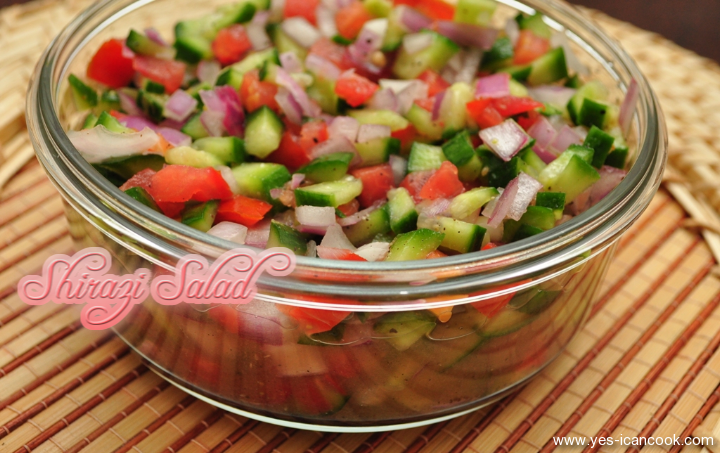 Very colourful and healthy salad..
cororful and awesome salad... I am ur new follower... will be glad if u follow me back.. Thanks a lot. I sure would love to follow you. Hi, I have nominated you for versatile blogger award. Aaawww.. Thanks Subha. I am so humbled. Wonderful looking salad. Do you use all of the tomato? Some recipes call for the pulp part of the tomato to not be used. I guess so there isn't added moisture I believe. But thanks for sharing and look forward to trying.